This eerily warm winter has been toying with the children again. They were so excited this morning to find that it had snowed an unexpected amount over night. 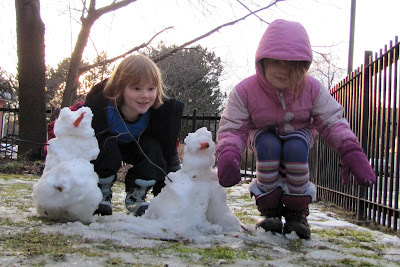 I had to tell them not to get too excited because the temperature was going to be so warm that probably all the snow would melt by the time they got home from school. They wept bitterly, in their hearts. And whined a lot out loud. And also were extra slow getting to school, due to having to jump in as much snow as possible, while it was there, all the way. Anyhow, all the snow was not gone when they got home. Merely almost all of it was gone. The kids kicked into gear. Not a moment to lose. Before it all melts! They scraped up all the snow they could find, before it was too late, to spawn some snowmen. Short, lumpy, sickly looking snowmen. But... well, at least they have each other. If you look closely you'll even see that they're holding hands. It's true. Istra also would like to point out her snowman has legs and is wearing pants. And that's how we're coping with "winter" so far. I'm so glad they got to make the snowmen!